What kind of anesthesia should be considered for wrist arthrodesis procedures? When does it become necessary to administer general anesthesia? Is this procedure – once completed – going to leave the patient in much pain? As long as the procedure is limited to the wrist joint, the brachial plexus block (axillary block) is an appropriate form of anesthesia. 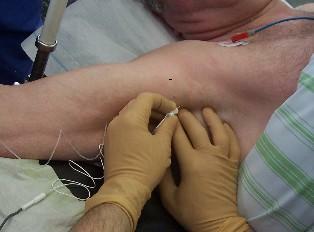 The image to the left shows an axillary block in progress. The injection occurs close to the nerves of the plexus which run in the armpit. This meshwork of nerves supplies the entire arm and hand with both, pain nerves as well as sensory nerves and it is also responsible for the motion of the muscles. In case of an axillary block a local anesthetic agent is injected into the shoulder/armpit area to numb all branches of the brachial plexus. This local anesthetic usually suffices to numb the arm completely for several hours. If the procedure requires the removal of bone tissue from the iliac crest, then general anesthesia is required. This certainly is a fairly strenuous procedure which over the first three to four days typically is being experienced as rather unpleasant by the patient, particularly if the surgery was not limited to the wrist joint but also included the iliac crest. Modern anesthetic medicine however does dispose of a variety of very efficient ways to eliminate pain so that the discomfort level is kept at a reasonable level. In addition, various anesthetists dispose of advanced pain management skills which the patient will benefit from greatly. It has to be clear though that a wrist arthrodesis is not by any means to be considered as small and non-strenuous procedure.